My whole life I've been very good at controlling how much I let people see. I've been good at hiding how I feel and only allowing people to know what I wanted them to know. I always considered that to be my greatest strength, in fact, I've always been impressed by how well I could hide the truth and hide my pain. But in recent months it has become increasingly harder to do. I perceived that to mean I was weak. Recently, I was made aware that one of the reasons why I'm so lost about who I am, is because I'm trying to find my way back to the versions of myself that each individual person thinks I am. I spent my life creating different versions of myself in order to suit, what I thought, different people wanted me to be. I have been struggling to find myself again because I couldn't locate a moment in my life where I allowed somebody to see me. The real me. So I wrote a list about who I am. 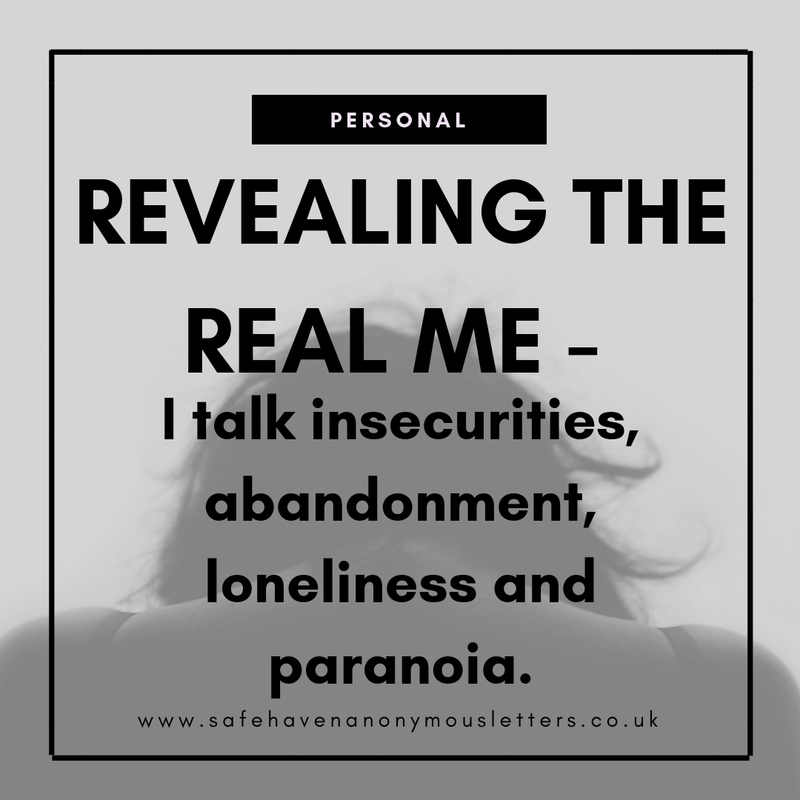 It was almost like a list of confessions; things only I've ever known about myself or things that I've only allowed certain people to know throughout my life. Some of what I wrote down, where things even I tried to hide from myself. The way for me to become my true self, is to become my true self to everybody. When I was told that I thought "how the hell am I supposed to just reveal myself to people". I mean, I wrote down some things that, to me, seem weird for other people to know. But here I am, about to reveal things about myself that, in it's entirety, has never left my mind before. I have always been severely insecure about the way I look, the way I talk, and the way I act. I'm also extremely sensitive which is never a good combination. 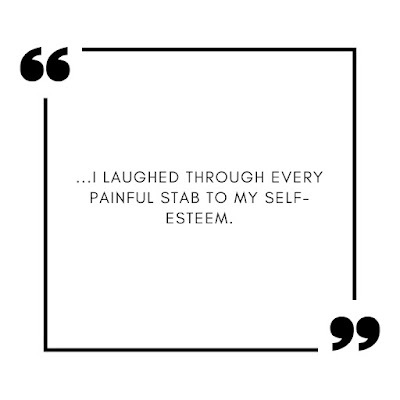 Throughout my life, family and friends have made innocent jokes about things that I was secretly and incredibly insecure about. I never said anything because I didn't want to reveal weaknesses that could be used against me. So I just laughed along. 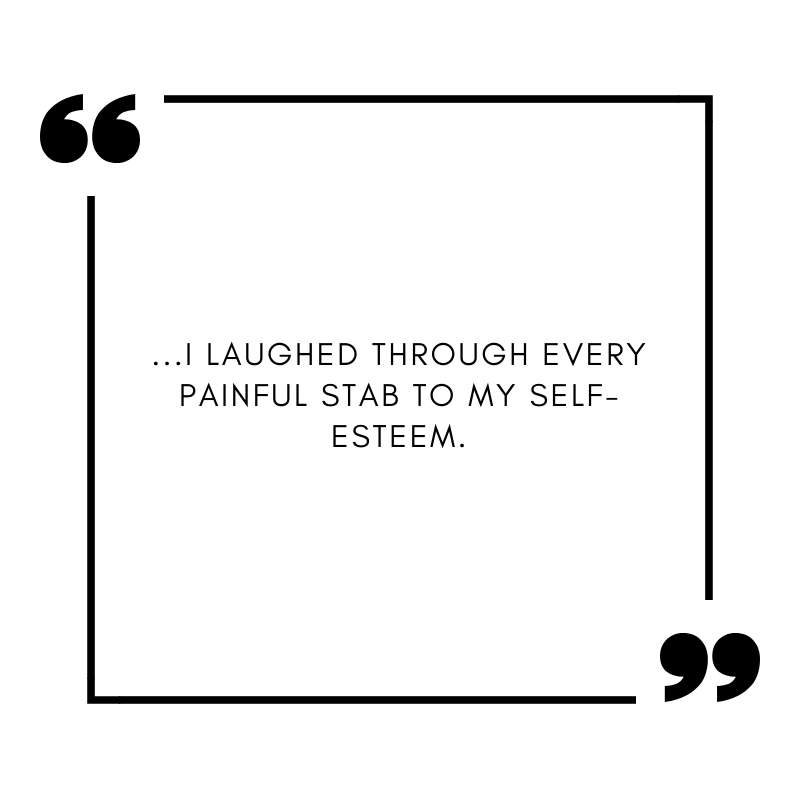 I laughed through every painful stab to my self-esteem. Those insecurities also tie in to my fear of being abandoned. When it comes to certain people in my life like, my cousins, my friends throughout the years, my best friends, my boyfriend - I hid my insecurities and tried to be a person each of them could love. I thought that, as long as I was a person that they wanted to love, rather than had to love, then maybe they wouldn't abandon me. I've never thought that I deserved their love. Something I have never once admitted to myself or to anyone else, is my paranoia. It's not on a crazy level by any means, especially because I've always been a logical thinker; that has always outweighed the paranoia. Paranoia that, I'm pretty certain, was in my genetics. That paired with my insecurities and my fear of abandonment, have always heightened the smallest of situations inside my head. I felt a sense of unwanted, unnecessary, and overwhelming abandonment with things like; my auntie changing our Christmas tradition after getting married, or my closest cousin drifting away to spend her time with friends, or my dad going out drinking all night with the one woman I didn't trust, or my my friends or boyfriend accidentally forgetting to reply or not saying I love you as much. Every single one of those situations was and is illogical and insignificant, yet every single one made me feel like I was being, or about to be, abandoned. And I have never gotten over my mum almost choosing to abandon me and leaving me without a mother. I also believe that they have all combined and resulted in my constant feeling of loneliness. I'm fully aware of the fact that my loneliness is completely self-inflicted. I've always been a regular to crying myself to sleep, and that's because of the many things I chose to silently deal with. I used to find it easier to cut myself, literally repeatedly cut my skin, than to lower my guard and talk to my family. I will never truly be able to describe how deep my fear of abandonment runs, and I have no idea if I'll ever rid myself of that fear, but I hope that through me admitting these things, not just to myself but to my loved ones, then maybe I will be able to face my fear and my insecurities. This is the hardest thing I have ever had to publish and although I'm relieved that I have been able to admit these things to myself, and although I'm excited at the prospect of me finding my way back to myself, I am still scared beyond measure about the people I love reading this. 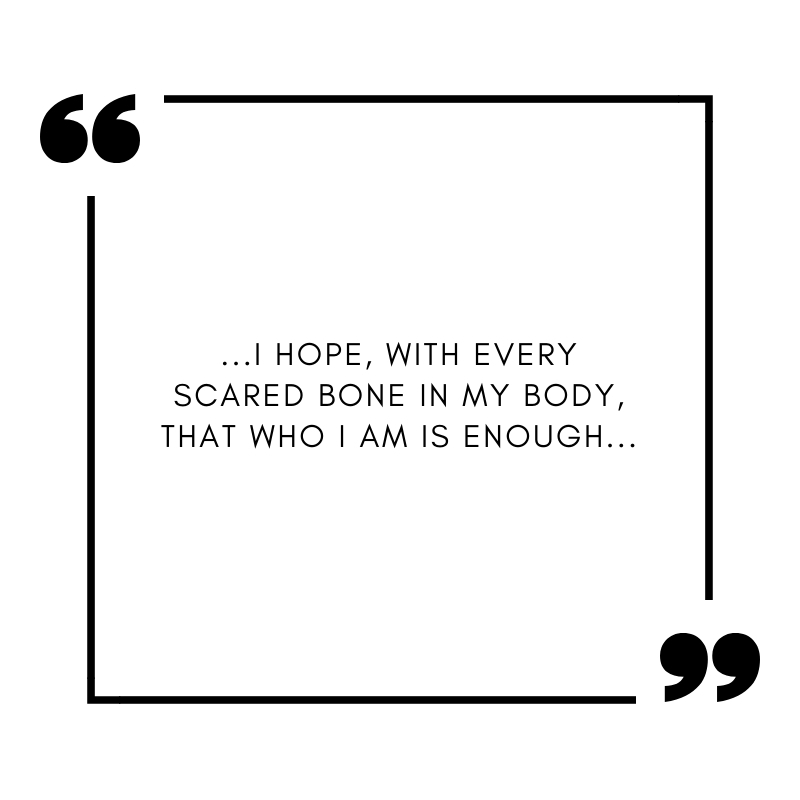 I hope, with every scared bone in my body, that who I am is enough.